2	. What do we know about the effects of paid family and medical leave on individual-level health and employment outcomes? 3	. What do we know about the effects of paid family and medical leave on firm-level business and employee outcomes? 4	. What do we know about the effects of paid family and medical leave on the economy as a whole? Caregiving needs in the United States reach across the life cycle. Every day, 10,800 babies are born, 4,754 new cases of cancer are diagnosed, and 1,329 people develop Alzheimer’s disease. 1 Yet millions of working Americans lack access to paid leave, forcing impossible choices between their caregiving responsibilities at home and their economic responsibilities at work. Workers who need time off to care for a new baby, a sick child, an aging family member, or their own health needs may do so at the expense of their financial well-being—or their jobs. Many eligible workers are unable to take unpaid leave due to an inability to weather the earnings loss during the leave period. A recent study by the Pew Research Center found that one in six U.S. workers employed in the past 2 years needed to take a medical or caregiving leave during this period, and nearly three out of four (72 percent) of these workers cited the consequent earnings losses as their main reason for foregoing leave. 3 Black and Hispanic workers, workers without a college degree, and workers in households with annual incomes of less than $30,000 were all even more likely to forego needed caregiving leave. Just more than half (54 percent) of those who didn’t take leave when they needed to say they didn’t take the time off from work because they feared losing their job. All of this is changing, as the action in the early-adopter states alongside more than two decades of data on federal unpaid leave has altered the empirical landscape. A growing body of research is helping expand the evidence illuminating how paid family and medical leave impacts workers, their families, businesses, and the economy as a whole. At the same time, many questions remain about the short- and long-term consequences of paid leave and about the effects of the absence of paid leave on a variety of economic variables. 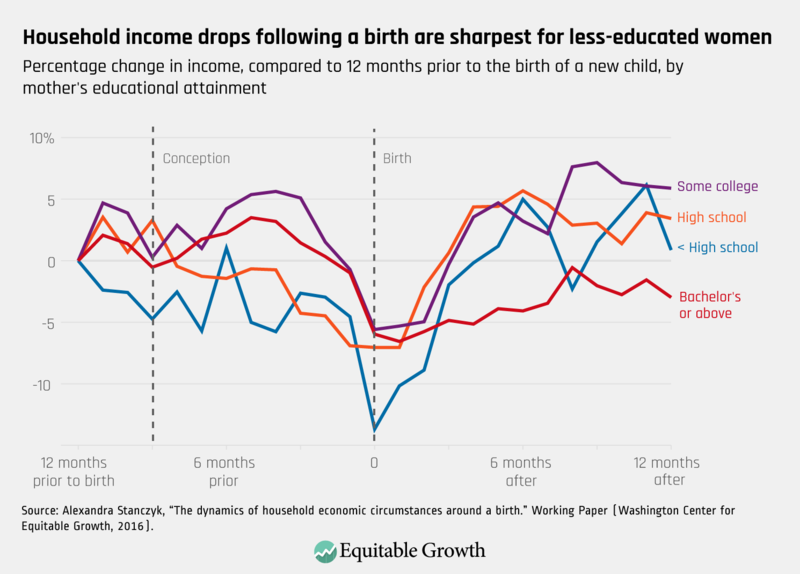 The experimentation at the state level, combined with early research on the consequences of federal unpaid leave, make the United States newly fertile territory for scholarship, with key lessons for policymakers looking to address the interwoven issues of family economic security and macroeconomic growth. This report provides a survey of what we know—and what we need to know—about paid family and medical leave in the United States. In addition to offering an overview of the existing academic literature, the pages that follow reflect many hours of informational interviews with key stakeholders and researchers in the field, as well as a day-long meeting hosted by the Washington Center for Equitable Growth that brought together a diverse group of experts from the academic and policy communities in order to elevate key research questions for the field. Throughout, whenever possible, the research is distilled for each type of leave—parental leave (to care for a new baby), medical leave (to care for one’s own illness), and caregiving leave (to care for an ill family member), given that variations in care responsibilities may have different ramifications across a host of outcomes. And, perhaps most critically, each section concludes with a set of key questions that together form a detailed research agenda to inform policy going forward. As policymakers across the ideological spectrum grapple with identifying pragmatic, empirically backed solutions to easing the work-life conflict between family caregiving and labor market responsibilities, the growing body of evidence from the states offers a great deal of promise for guiding decision-making. It is worth noting up front that because research questions remain, it does not mean that the current state of the evidence implies that more research is necessary before action. The successful implementation and performance of comprehensive paid leave policies at the state level should be taken as a sign that paid leave policies are, in fact, doable—and a growing body of evidence suggests promising short- to medium-term outcomes for families, business, and the economy. At the same time, the host of remaining unanswered questions provide a useful roadmap for researchers looking to inform the design of effective, efficient solutions that simultaneously bolster family economic security, minimally disrupt business operations, and foster broadly shared economic prosperity. The window of opportunity for building a research agenda that improves policy efficacy through timely, well-designed research is open, and now is the time to seize it. What do we know about the effects of paid family and medical leave on individual-level health and employment outcomes? The vast majority of the existing scholarship on family and medical leave policy in the United States focuses on individual outcomes, including labor market outcomes for leave-takers, health outcomes for care recipients, and, to a lesser degree, health and labor market outcomes for caregivers. In the following sections, we provide an overview of the knowledge base on each of these topics, looking at the experience of the states and, where relevant, national-level data, and draw out a set of research questions that remain in search of more evidence. Much of the earliest work looking specifically at the United States focuses on the effects of unpaid parental leave in the aftermath of the passage of the Family and Medical Leave Act in 1993. Despite the gender neutrality of the legislation, FMLA led to increases in leave-taking for mothers but has had little to no significant impact on fathers’ likelihood of paternity leave. 11 The 25-year-old law has extended the duration of paternity leave for those who take it—increasing the duration of leave by 4 percentage points—yet because fathers’ leaves around childbirth are typically limited to a day or two within the first few days of a child’s life, the absolute gains are quite small. 12 The increase in women’s leave-taking in response to job-protected, unpaid leave is driven almost entirely by women with a college degree, who tend to be higher earners. 13 These findings suggest limits to the labor market consequences of unpaid leave policies and the potential importance of paid leave policies to induce leave-taking among both fathers and economically vulnerable groups. In the absence of public paid leave policies such as those widely available throughout the developed-economy member nations of the Organisation for Economic Co-operation and Development, researchers interested specifically in the U.S. case have turned to employer-based paid leave in order to better understand how paid parental leave impacts labor force outcomes in the American context. For instance, studies of employer-based policies in the United States in the 1980s and 1990s suggest that mothers with access to paid maternity leave work later into their pregnancies and are more likely to spend the month following birth caring for their child, though they return to the labor market at a higher rate than their peers without access to paid leave. 14 But the limited availability of employer-based paid leave in the United States, coupled with the difficulty of accessing private-sector data, means that the research on the results of paid leave via private-sector policies is of limited utility for U.S. policymakers seeking to better understand how to expand access to policies that facilitate a better balance between work and care responsibilities. What’s more, much of the benefits of paid parental leave policies in those states accrued to workers at the bottom of the economic distribution. Research on California and New Jersey indicates that the increase in labor force attachment in the months following a birth is driven almost entirely by less-educated women, who are less likely to have access to or to take leave in the absence of the state policy. 17 More than 20 percent of workers in low-quality jobs in California report that taking parental leave improved their ability to find childcare, which may help explain their increase in labor force attachment relative to peers without access to paid leave. 18 Given that low-wage, less-educated workers are least likely to be covered by federal protections requiring access to unpaid leave, as well as least likely to be able to afford an unpaid leave in the presence of job-protected FMLA leave rights, it is not surprising that broadly accessible paid leave policies in the states are proving to be the most beneficial for these groups of workers. Many related questions persist regarding how paid parental leave policies may have differential effects on labor outcomes by gender. These questions are of particular importance for parental leave because of women’s unique role in pregnancy, birth, and the immediate early lives of infants. To what extent do wage replacement rates—the percent of a workers’ income replaced by paid leave benefits—shape employment outcomes and earnings trajectories across the earnings distribution? To what extent does leave duration and intermittency shape employment outcomes and earnings trajectories across the earnings distribution? Do these outcomes vary by gender? How do labor market effects of paid parental leave differ across racial and ethnic groups, and how do these racial differences (if any) interact with the differing impacts across the earnings distribution? These questions are particularly difficult in the absence of high-quality data with racial/ethnic identifiers. Researchers currently face a trade-off between high-quality administrative data that lacks such information and lower-quality survey data that may contain more detail on demographics. How do the labor market consequences of paid parental leave differ depending on the employment and earnings status of the other parent? And how do paid parental leave policies impact intrahousehold labor supply and earnings trajectories? Answering these questions requires high-quality linked longitudinal data allowing researchers to track individuals in the context of their households/families. Preliminary evidence from California suggests that paid caregiving leave increased the short-run labor force participation of caregivers by 8 percent in the first 2 years following implementation and by 14 percent in the first 7 years of the program. 31 But women made up the entirety of the increase in labor force participation, highlighting that even in the presence of paid caregiving leave, women continue to take on the majority of caregiving responsibilities across a family’s generational life cycle. In the first 2 years following implementation, the majority of the increase in caregivers’ labor force participation was among those from high-income households. In the longer term, however, labor force participation for low-income caregivers overtook those from higher-income households, indicating the particular importance of paid caregiving leave for promoting labor force attachment among lower-income workers. New research is pushing forward on uncovering the labor market effects of temporary disability insurance for medical leave. One recent study using administrative data from Rhode Island’s medical leave program finds that recipients of temporary disability leave who received vocational rehabilitation services were more likely to return to work and earn higher wages upon their return to work than those who did not receive those services. 37 Yet far more research is needed in order to have a robust evidence base on how medical leave impacts labor market outcomes. In general, a host of questions about the long-term consequences of access to paid caregiving leave persist. Because paid caregiving leave is rarely accessible in the absence of public policies such as those in the handful of states with their own family and medical leave policies, this area is particularly thin on evidence for many critical questions of outcomes. As state family and medical leave programs that offer broad access to caregiving leave continue to mature (and additional states bring their programs online), researchers ought to pay particular attention to questions of the impacts of these programs. Evidence on the impacts of paid medical leave is similarly thin. This is more surprising, and presumably more quickly remediable with research, given that four of the seven states with paid family and medical leave insurance programs use their individual state Temporary Disability Insurance programs as the foundation for expanded family and caregiving leave. Researchers interested in understanding the labor market outcomes of medical leave should make use of the existing data from the four states with such longstanding programs to begin to offer some clearer evidence on how access to medical leave to care for one’s own serious illness affects short-, medium-, and long-term labor market outcomes. Basic questions about how families need to use medical and caregiving leave remain poorly understood. The data are clear about the need for leave and the basic financial hardships created in the absence of access to leave. Less clear is how families use the leave. Medical needs vary substantially, as do caregiving needs—different illnesses require different levels of intensity of care, and different family support resources can mean varying degrees of care required from any given individual. Future research should work to better understand the lived experience of care across the economic distribution, with attention to whether care needs vary by race, age, and other key demographic factors. As with parental leave, variation in elements of policy design for paid medical and caregiving leave may have important consequences on labor market outcomes. Future research should investigate how different elements of leave policy design impact labor force attachment, employment, wages, and career trajectories, which are probably even more important given the lack of a “typical” illness requiring care. Key policy design dimensions include wage replacement rates, leave duration, intermittency of leave, and job protection. Better research is needed on how the labor market effects of paid medical and caregiving leave differ across racial and ethnic groups. And how do these racial differences (if any) interact with the differing impacts across the earnings distribution? Answering these questions is particularly difficult in the absence of high-quality data with racial/ethnic identifiers. Researchers currently face a trade-off between high-quality administrative data that lacks such information and lower-quality survey data that may contain more detail on demographics. More broadly, how do labor market impacts of paid medical and caregiving leave differ across the earnings distribution? This is important to understand because the distribution of health and differential risk factors might impact both demand and supply. Intrahousehold dynamics also matter for paid medical and caregiving leave. How do the labor market effects of paid caregiving leave differ depending on the employment and earnings status of the other parent? And how do paid caregiving leave policies impact intrahousehold labor supply and earnings trajectories? Answering these questions requires high-quality linked longitudinal data allowing researchers to track individuals in the context of their households/families. Paid parental leave’s impact on children’s health outcomes is a central and powerful argument for expanding access. International evidence looking across low- and high-income countries suggests that paid maternity leave delivers powerful benefits for infant mortality, a key indicator of population health. 38 The comparative studies suggest that the introduction of parental leave policies plays a critical role in lowering rates of infant mortality and low birth weight, and that longer leave policies correlate with better infant health and lower child mortality rates. 39 Yet context matters, as the countries studied have different health care, childcare, and labor policies that may interact with paid parental leave and make it difficult to extrapolate to the impacts of a potential U.S. policy. Moreover, using cross-national comparisons creates methodological complications that can make it difficult to isolate effects meaningfully. 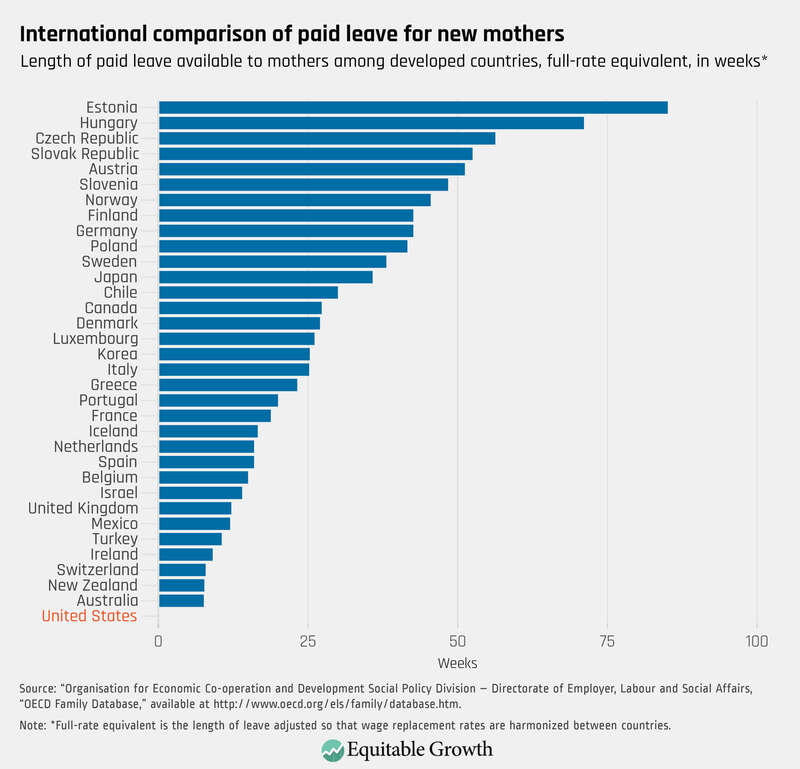 Cross-national comparisons typically include both the introduction and extension of paid parental leave policies, but problems with endogeneity—the possibility that an unknown factor is driving both the extension of parental leave, as well as trends in the outcome of interest—make it difficult to interpret the findings in a meaningful way. Single-country studies typically find little impact of paid parental leave on health, but those limited consequences are probably because the variation available for study in single-country studies comes from extensions of existing policy rather than the introduction of new policy. Indeed, the main health effects of parental leave policy typically come from the introduction of new policy rather than extension of existing policy. 40 This is why new research from the U.S. states that have introduced paid family and medical leave policies is so critical. From a theoretical standpoint, there are good reasons to believe that paid parental leave may impact not only infant health but also children’s health outcomes over the long term. While the impact of paid parental leave on infant health is an obvious starting place, paid time off early in a child’s infant life may have significant ripple effects across the life cycle such that the health effects of paid leave may last significantly past early childhood. One study on the long-term benefits of paid parental leave in California finds improvements in health outcomes among kindergarteners, including lower rates of diagnoses of attention deficit/hypertension disorder, lower rates of obesity, lower rates of ear infections, and fewer hearing problems. 46 The benefits of paid parental leave were most apparent among children with lower socioeconomic status. And all of these health outcomes are negatively correlated with the infant health factors that other research suggests paid parental leave promotes, including breastfeeding, timely infant medical check-ups, re-educated prenatal stress, and reduced nonparental care during infancy. While most of the research on child health outcomes focuses on mothers as the primary channel mediating health outcomes, parental leave may also impact child health outcomes through fathers’ interactions. Research establishes that the quality and quantity of interactions that a father has with his children in early life can contribute to their cognitive development over a lifetime, independent of mothers’ levels of sensitivity. 47 Studies of California’s paid leave program suggest that gender-neutral paid parental leave that allows both fathers and mothers to take bonding leave with a new child significantly boost men’s take-up rates, compared to unpaid leave options. One rigorous study found that California Paid Family Leave policy raised the likelihood that a working father would take leave in the first year of his child’s life by 0.9 percentage points—a large increase, given the very low levels of leave taken by fathers. 48 In short, while mothers are still more likely to take leave, fathers are far more likely to take parental leave if that leave is paid. The evidence in Europe of the benefits of paid leave and maternal mental health points is overwhelming. One study of European mothers finds that depression among women over the age of 50 was strongly negative correlated with the length of maternity leave for their first child. In other words, new mothers who were able to take lengthy parental leaves were far less likely to be depressed in their older years. 52 Of course, like other studies based on European data, these findings should be treated with caution when applied to the U.S. case, but they provide promising evidence for research lines to be mined. A wide range of mechanisms may connect parental leave with both short- and long-term health outcomes for children and for caregivers. Identifying the casual pathways through which parental leave affects child health across the life cycle is an important next step for U.S. research. Projects that link administrative data on paid leave with administrative data on health outcomes are of particular promise but face data privacy and access challenges. Understanding the distribution of the health effects of paid parental leave is critical, especially given the substantial economic and racial health disparities that characterize the United States. Given the challenge of obtaining high-quality data that includes racial/ethnic information, this is an important area of inquiry for scholars going forward. Varying elements of policy design may have different results on various dimensions of the health-related outcomes of parental leave. For instance, wage replacement rates, duration of leave, and job protection may matter differentially for mothers versus fathers, or for different earnings or occupational groups. Better understanding the channels through which policy design impacts health effects is a critical line of inquiry going forward. The scholarship on health-related outcomes stemming from access to paid medical and caregiving leave is less well-developed than that of parental leave. Because of the diversity of diagnoses and family circumstances that surround the need to take leave—either for one’s own serious illness or to care for a family member with a serious illness—effectively designing research to investigate the nuances of such types of leave is substantially more difficult than research projects designed to understand the (relatively) more standardized caregiving needs surrounding the arrival of a new child into a family. The majority of unpaid leave claims under the Family and Medical Leave Act are for medical leave, and in both California and New Jersey, about one in two paid leave claims are filed for personal medical reasons not related to childbirth. In both states, claims filed for personal medical reasons are for substantially longer durations than claims filed for family caretaking. The most commonly given reasons for nonchildbirth related medical leave claims in New Jersey include “disabilities related to bones and organs of movement, and disabilities resulting from accidents, poisoning, and violence,” according to the New Jersey Department of Labor and Workforce Development. 57 In contrast, the number of claims for caregiving leave is relatively small, which creates challenges for researchers due to the resulting small sample size available for study. While the number of claims is relatively small, the data indicates a high degree of unmet needs for both paid medical leave and paid caregiving leave. The U.S. Bureau of Labor Statistics’ National Compensation Survey finds that only 17 percent of civilian workers have access to paid family leave. 58 Indeed, nationally representative data from the Pew Research Center finds that 9 percent of respondents had an unmet need for leave to care for their own health, and 10 percent of respondents had an unmet need to take leave to care for a family member. 59 Higher-income workers are more likely to have access to paid leave than their lower-income counterparts. Pew reports that 74 percent of leave-takers earning $75,000 or more annually received payment during their leave. In contrast, only 38 percent of low-income leave-takers received payment, despite people with lower incomes being more likely to suffer from poor health than their wealthier counterparts. 60 The high variation in health across the socioeconomic spectrum, coupled with the existing upward skew of leave availability to those in higher-paying jobs, means that the demand for medical leave may vary sharply across the economic distribution. A basic question encompasses the most relevant health-related research agenda for better understanding medical leave: How does paid medical leave impact individual health outcomes for those who take it? Currently, only a scattered few studies shed light on this question. For instance, a study assessing the effects of paid leave on health outcomes for nurses who experienced heart attacks found that those with access to paid medical leave were more likely than those without paid leave to return to work following recovery. 61 Yet a variety of factors limit the generalizability of this study to a broader set of conclusions regarding the health effects of paid medical leave. The small study size and specialized population (nurses with either angina or myocardial infarction) makes it too narrow to extrapolate broader conclusions. Moreover, the outcome variable studied—return to work—may not reflect a health-related outcome, given the myriad factors that come into the decision of whether to return to work following a health crisis. More robust research looks specifically at the effects of universally accessible paid sick leave using U.S. data and finds that access to paid sick leave increases flu vaccinations by 1.6 million, which, in turn, leads to 63,800 fewer absences and 18,200 fewer health care visits due to illness. 62 Paid sick leave policy differs from paid medical leave along two key dimensions. First, sick leave typically guarantees access to a limited number of paid sick days, as opposed to the longer periods of time available under paid medical leave. Second, in the cases where public policy exists, paid sick leave is generally provided and paid for by employers because of a legal mandate that employers offer a minimum number of earned paid sick days to employees. 63 In contrast, all four states with paid family and medical leave policies have adopted a social insurance model funded by workers, employers, or both, and the policy design distinction likely results in meaningful differences in a variety of outcomes due to the differential treatment of both employers and employees. Nonetheless, the established connection between paid leave and health outcomes is a useful signal to both researchers and policymakers that lessening the trade-off between work and self care may have salutary outcomes for worker health, employers, and broader systems, including health care. Substantially more evidence is needed to better understand the health effects of paid medical leave, including research that takes into account the varying potential lengths and intermittency of leave necessary for different medical conditions. More research also is necessary to understand the mechanisms linking paid medical leave and health outcomes. A variety of channels could explain the preliminary connections illustrated in the current research. For instance, does the health of workers improve because those on leave are able to seek care in a timely fashion or can afford access to the most appropriate course of treatment and/or continue to receive necessary regular treatments for recovery? Does health improve because paid leave allows workers to maintain a basic level of economic security while receiving treatment, which alleviates stress and contributes to overall well-being? 64 A future research agenda ought to take seriously the diverse literature on the determinants of health outcomes in order to grow the evidence on whether and how paid medical leave directly or indirectly contributes to better health outcomes for all. Paid caregiving leave also may impact the health outcomes of the individual receiving care from a family member. One study reports positive physical and mental health outcomes for disabled children whose parent(s) are able to take paid caregiving leave. 73 Research suggests that the role of the family caregiver has become all the more critical in light of the way health care is delivered, especially for acute illnesses requiring hospitalization. For instance, hospitalists—doctors with specialized training to provide care for acute illnesses in a hospital setting—provide the bulk of inpatient care. The expertise and consistent availability of a hospitalist has had important positive impacts, but continuity of care has suffered. Patients may not know who is in charge of their care and often do not remember their doctors’ names due to the constant shift-changes that bring new hospitalists in and out of a patient’s room over the course of hospital stays. As a result, families have found it necessary—and are often encouraged by physicians—to be present at all times in order to monitor medications, to insure that tests are carried out and results are received, to alert the rapid-response team if need arises, and, in general, to serve as a patient advocate in the context of a health care system that makes this all the more necessary. 74 The hypothetical connection between paid caregiving leave and patient outcomes is straightforward: If paid leave increases the prevalence of family caregiving, and family care improves patient outcomes, then paid caregiving leave is likely to have a direct impact on patient health. Yet, to date, research has not yet unpacked this story. Future research should address the connection between paid medical leave and health outcomes in order to better clarify the mechanisms. Paid medical leave may facilitate health outcomes through both time and money—more time for receiving the most appropriate medical care at the appropriate time and more money for receiving the right type of care over the period of time. Scholarship that helps point to the channels through which paid medical leave affects health outcomes is key to designing efficient policies that achieve the desired outcome. The need for paid caregiving leave is well-established, but many questions remain about the precise nature of the need and how the unmet demand for leave varies across a wide range of characteristics of both the caregiver and the care recipient. Similar to the questions around medical leave, more research is needed to better understand the variety of types of illnesses for which families need caregiving leave, the duration of leave, whether demand for leave is intermittent or longer, uninterrupted blocks of leave, and how the demand varies across age, race, gender, and income. Myriad questions remain about whether and how paid caregiving leave affects the physical and mental health of caregivers and whether the duration, intermittency, or economic security provided by the leave also affects these health outcomes. In addition, questions remain about whether the impact of paid caregiving leave varies depending on the economic position of the caregiver and/or the care recipient. Similarly, many questions remain about whether and how paid caregiving leave affects the physical and mental health of those receiving care. In particular, future research should pay careful attention to whether consequences vary based on the design of the leave policy, as well as whether paid caregiving leave varies by the economic position of both the caregiver and/or the care recipient. What do we know about the effects of paid family and medical leave on firm-level business and employee outcomes? The Netflix example is emblematic of the persistent inequalities in working conditions in an increasingly polarized workforce and suggests that coverage for the workers who are least able to afford unpaid leave is unlikely to come from employers. It also raises questions regarding the consequences for firms of paid family and medical leave for their employees. In the case of Netflix, the extension of paid parental leave to digital employees was widely interpreted as a response to the low numbers of women in technology—by offering unlimited paid maternity leave to its highly compensated tech workforce, Netflix used the paid leave benefit as a recruitment and retention incentive for female employees. Does the research suggest that this is indeed the case—does paid leave help with recruitment and retention? Myriad other employer-side questions persist regarding paid family and medical leave as well. How does paid leave impact turnover costs, if at all? How does paid leave impact productivity, if at all? How do employers handle worker absences? And how do the answers to each of these questions vary depending on employers’ size, industry, occupational mix, and/or location? 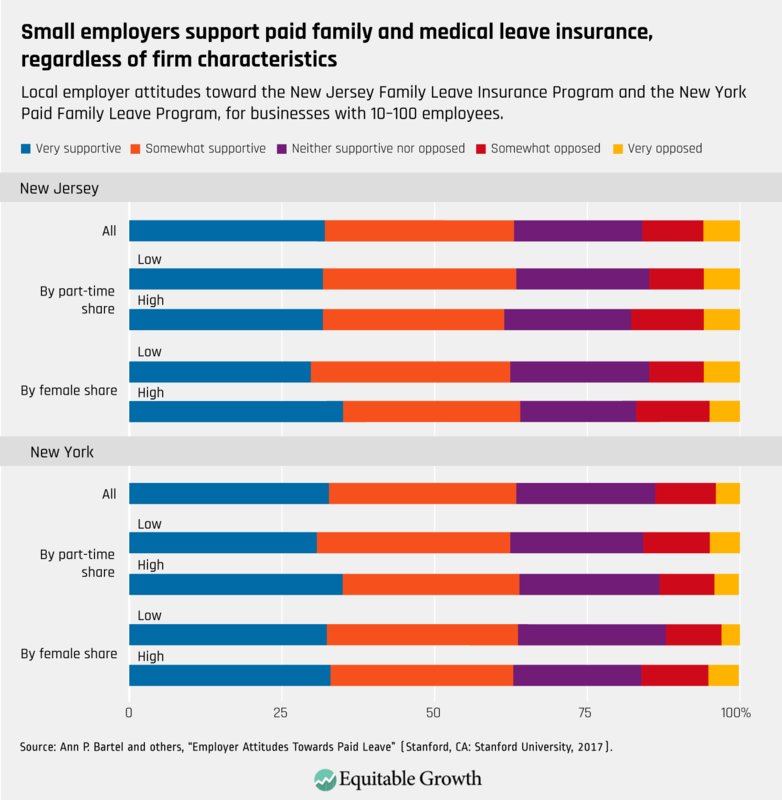 The early survey-based research on the firm-level effects of paid family and medical leave from the states suggest that businesses generally view the policies favorably. 77 The existing state programs are funded by a small employee 78 payroll tax—generally between half a percent and 1.5 percent—and in return, workers taking leave have a share of their wages replaced by the state programs. Across the four states with existing paid family and medical leave policies (California, New Jersey, New York, and Rhode Island), employers report significant benefits and minimal costs. Turnover is expensive for businesses. If paid leave plays a role in reducing turnover, then the small short-term cost of covering an employee’s leave may result in substantial medium- and long-term rewards. Hiring and training a new employee is costly for managers, who spend less time on other productive activities as a result. And new workers require time to get fully up to speed in their new positions. Prior research on the cost of turnover suggests that replacing an employee costs about one-fifth of that worker’s salary, based on a combination of the cost of recruitment, selection, and training. 85 Early research from the states with paid leave programs suggests that paid leave can reduce worker turnover, which, in turn, means lower costs and higher productivity for business. Yet more research along these lines is crucial for better understanding the cost and benefits of paid leave for firms. How does the cost of turnover vary across industries and occupations? Does the cost of turnover vary across local labor markets? And is the cost of turnover higher in tight labor markets, thus meaning the retention benefits of paid leave are higher? The impact of paid leave may also vary by industry and occupation. To date, we are not aware of any research answering this question utilizing U.S. data. A study utilizing Danish data suggests that large take-up rates of paid family leave among nurses led to higher hospital readmission rates and higher mortality rates for the elderly, presumably because hospitals were unable to replace the nurses on leave. 93 Additional research using data from the United States is needed to clarify the ways that employers cope with leave-based worker absences and how the impact of those absences varies across business size, industry, occupation, and other critical firm characteristics. A third critical area in need of further research is the variation in the ways that different types of paid leave may impact firms. As discussed throughout this paper, parental, medical, and caregiving leave are distinct from each other in a variety of ways. Parental leave is relatively predictable, and the typical optimal duration of leave is relatively well-understood based on the physical and emotional health needs of both new babies and new parents. 94 Medical and caregiving leave are far less well-understood in terms of their predictability, duration, and intermittency. So, the nature of the work interruption stemming from a medical or caregiving leave is far less easily modelled than parental leave, which creates a challenge not only for firms but also for researchers seeking to understand the consequences of such leaves. Finally, other demographic characteristics may result in differing levels of demand for leave, with varying consequences for firms. For instance, the duration of leaves may vary by the earnings level of the worker. On the one hand, perhaps lower-earning workers are more likely to take longer leave because their social networks consist of few others who are able to go without pay to care for a loved one, and the cost of childcare and/or eldercare remains prohibitively high. 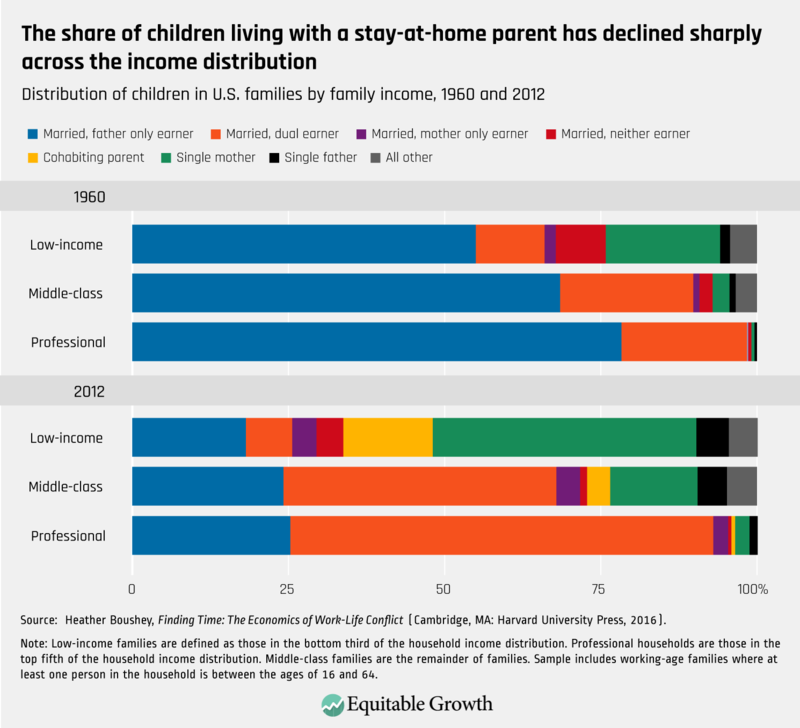 On the other hand, perhaps lower earners are likely to take short leaves because a wage replacement rate of less than 100 percent means that even paid leave comes with meaningful consequences for family economic security. Low-earning workers and their families may also be in poorer health than higher-earning individuals, creating disparities in the demand for leave. Similar differences may play out across industries and occupations based on the mix of employees. The high levels of variation in how leave may play out across employers—by type of leave, by employee characteristics, and by firm characteristics—is a compelling argument for a public universal program. Small employers, employers with high concentrations of low-skill, low-wage workers, and others are least likely to offer firm-provided benefits to employees because the cost of doing so would be quite high. In the absence of a public paid leave program, the cost of wage replacement for absent workers falls entirely on the firm. Yet diverse effects across types of firms persist even in the presence of a universal public paid leave program—the costs, consequences, and benefits may vary substantially across different types of firms. Further study utilizing the data from the states and other U.S.-based policy experiments would be immensely useful. How do paid parental, medical, and caregiving leave impact firm productivity? Turnover is one piece of the productivity puzzle, as lower worker turnover presumably improves productivity by retaining well-trained, productive employees. But paid leave also may affect productivity through other channels such as by improving productivity by reducing absenteeism and allowing for more predictable, planned leaves that allow firms to more adequately cover for employee absences, and/or it may improve morale. On the other hand, paid leave may diminish productivity if it encourages workers to take leaves or take longer leaves than they might otherwise have taken. These questions of productivity are critical to answer and are likely to vary across firm types, industries, and occupations, as well as across different types of leave. More rigorous research is needed to uncover these consequences. How does worker turnover, including the cost of turnover, vary across industries, occupations, and local labor markets? In general, firm-side effects of paid leave may differ in important ways across industry, occupation, and firm size. In addition, the effects may vary by geographic location. Local labor markets may shape the productivity effects or turnover costs of leave, for instance, while regional cultural differences in caregiving and gender roles may affect who takes leave, for what reasons, and for how long. All of these facets are important angles for future research seeking to better understand how paid leave impacts firms. How does paid leave vary in its impact across these various dimensions? Future research should focus more discretely on the firm-side effects of different types of leave: parental, medical, and caregiving. The current research tells us little about how variation in both firms and the types of employers who use different types of leave may impact firm-side outcomes, as most research to date focuses narrowly on parental leave. Future research should focus on both medical and especially caregiving leave in the context of the range of firm-side outcomes described in this section. What do we know about the effects of paid family and medical leave on the economy as a whole? The health of the U.S. economy depends on both households and firms. In other words, both household and firm dynamics affect supply and demand in important and often underappreciated ways, and the combined effects are what determine whether the economy is growing, who is benefiting from that growth, and the stability and durability of that growth. This basic point often gets lost in the day-to-day conversation about economic growth and stability, which too often focuses on short-term business performance and market fluctuations. Caregiving responsibilities impact economic growth and stability in important ways that are often relegated to a side-show conversation about “women’s issues”—if they are included in economic policy discussions at all. While this pattern has begun to change in recent years, more work remains to be done in order to make caregiving responsibilities a front-and-center economic policy issue. Caregiving responsibilities play an important role in shaping labor supply through their impact on individual workers and families, as detailed in the above sections. The way that our society supports (or fails to support) the balance between work and care plays a powerful role in shaping who is able to contribute to the labor market, as well as what and when they are able to contribute. Caregiving responsibilities for workers also shape the labor demand side of the equation, as firms’ demand for labor is affected by factors such as productivity, turnover, and absenteeism. Paid leave also may have important spillover effects on other policies, including existing public and private programs with important macroeconomic effects. These pieces come together to suggest that paid leave may impact not only individual health and labor outcomes and individual firm outcomes, but also boast the potential to shape economic growth and stability in important and understudied ways. A key takeaway worth highlighting up front is the need for more research on how all of these pieces of the puzzle fit together. The experimentation at the state level creates opportunity for more rigorous research clarifying how paid family and medical leave policies may be impacting broader economic growth and stability. But one recent paper using survey data to examine the effects of California’s paid parental leave program finds that the increase in young women’s labor force participation was accompanied by an elevated unemployment rate and longer durations of unemployment for young women. 103 While this finding could be interpreted in various ways, one parsimonious possible explanation for the increased unemployment rate and duration is that the increased labor supply generated by the paid leave policy was not met with a sufficient immediate increase in labor demand to accommodate the additional workers who entered the labor market as a result. Future research ought to study the dynamics of labor supply and potential unintended consequences as a result of paid leave policies, with special care to take into account local labor market conditions over an appropriate time horizon to allow for equilibrium. In general, more research is needed about how paid leave for both one’s own illness and for caregiving is affecting labor supply, with a particular focus on whether it is concentrated at the low or high end of the wage spectrum and how the consequences are distributed across the age profile of workers. The absence of a widely available, national, public paid family and medical leave policy also has potential implications for the nation’s fiscal picture. Caregiving comes with costs that may be shifted onto other public programs. The costs of delayed medical intervention, for example, may result in more expensive health care costs in the long term, with implications for public programs such as Medicare and Medicaid. Early retirements by caregivers unable to balance work and family may result in stress to the Social Security retirement system. Labor force exits due to disability may result in elevated Social Security Disability Insurance applications and elevate costs to taxpayers, with long-term consequences for both SSDI costs and for labor force participation among individuals on the margins of the labor market. A small but growing literature focuses on questions relevant to this line of inquiry. For instance, one study finds that paid family leave reduces applications to other social safety net programs, with women returning to work following a paid maternity leave having a 39 percent lower probability of receiving public assistance and a 40 percent lower chance of receiving Supplemental Nutrition Assistance Program benefits (commonly known as food stamps) in the year following a child’s birth, compared to those who took no leave at all. 109 But more rigorous research investigating the links between family’s unmet caregiving needs and existing social programs is critical for understanding the full economic impact of paid family and medical leave policies. Examples of important future lines of inquiry include program interactions with public disability policies, health care policies, and long-term care policies. The link between paid medical leave and the Social Security Disability Insurance program is perhaps the first and most obvious connection that demands further exploration. If workers had access to temporary disability benefits that allowed them to continue to receive a substantial share of their wages while they recuperate from a serious medical condition, then would those facing such conditions stay in the labor force rather enrolling in SSDI? Could the introduction of temporary disability benefits help reduce the duration of SSDI benefits among those who do ultimately enroll? An extensive body of research documents the ways that SSDI may discourage the return to work among individuals with work interruptions due to disabilities, and the program is “sticky,” meaning that most eligible enrolled recipients do not return to the labor force once qualifying for benefits, regardless of age. 110 In particular, SSDI requires that applicants reduce labor force participation to keep their earnings under a certain threshold for a 5 month period in order to qualify for SSDI benefits. Following qualification, beneficiaries begin a 9 month trial period that allows them to exceed the earnings threshold in order to test whether they can return to work, after which a short grace period ensues and individuals with wages above the threshold are cut off of SSDI benefits. The result is a system with rigorous requirements for enrollment in SSDI, but also one that potentially discourages work among those who have no choice but to reduce labor force participation while waiting for an eligibility decision. Disability rates in the United States are remarkably high. By age 50, the average working male American has a 36 percent chance of having experienced disability at least temporarily during his working years. Chronic and/or severe disability comes with serious economic consequences, including a 79 percent decline in earnings, a 35 percent decline in after-tax income, and a 24 percent decline in food and housing consumption. Research consistently finds that individual savings, family support, and existing social insurance programs play a “partial and incomplete” role in reducing the consumption drop that follows disability. 111 Thus, efforts to support workers in their efforts to both care for their own major medical needs, while simultaneously maintaining their economic well-being and potential participation in the labor market going forward is an issue likely to touch a remarkably high share of the labor market. This is only likely to grow as the workforce ages. Recent studies exploiting variations in SSDI program examiners (the judges who determine whether an individual qualifies for SSDI based on the severity of his or her health condition) suggests that marginal individuals’ labor supply decisions are strongly influenced by the availability of SSDI benefits. Specifically, one study finds that 23 percent of SSDI applicants are on the margin of program eligibility, meaning their receipt of SSDI was conditional on their program examiner. 112 Of that group, employment would have been 28 percent higher in the absence of SSDI receipt 2 years after the initial eligibility determination, and average individual earnings for this group would have been about $3,800 to $4,600 higher per year. Compared to the nonmarginal SSDI recipient, marginal recipients were likely to be younger, more likely to have a mental disorder, more likely to have earnings in the bottom of the earnings distribution, and more likely to have higher medical costs and longer program enrollment duration. Prior research suggests that access to other social safety net and social insurance programs affects SSDI application rates. For instance, unemployment insurance recipients are less likely to apply for SSDI than similarly situated individuals who are not eligible for unemployment benefits. 113 If access to paid medical leave could play a role in supporting labor force attachment for these marginal SSDI applicants, then the lifetime earnings and employment outcomes for individuals and their families could be improved. Moreover, the additional labor force attachment fostered by a paid medical leave program could significantly relieve fiscal pressures on SSDI, which faces serious funding challenges due to higher-than-anticipated enrollment and continued program costs. The existence of Temporary Disability Insurance Programs in the handful of states that have built their paid family and medical leave programs on this system’s foundation provide a helpful starting place for researchers interested in exploring the potential relationship between paid temporary medical leave, earnings and employment, and SSDI. One promising research project from a team of researchers at the University of Massachusetts Boston is exploring this relationship in a new project supported by the Washington Center for Equitable Growth, but additional creative work is necessary to build out the knowledge base on how temporary medical leave programs might interact with the SSDI program. 114 Given the role that SSDI’s fiscal challenges play in debates over the financial stability of the Social Security system as a whole, this research is particularly important and likely to have an audience that reaches beyond those interested in caregiving to include scholars and policymakers more interested in questions of fiscal responsibility and budget. While these early studies provide good reason to hypothesize positive outcomes for paid family and medical leave on broader health systems outcomes more generally, more research is needed to connect the dots between the individual- and family-level health outcomes, including those detailed at length above, and the overall systemwide consequences of improved health on both economic performance and on health care systems savings. 117 Moreover, the public health crisis of opioid addiction is one that may overlap substantially with the need for both paid medical leave and paid leave for family caregivers. Taken together, the impact of paid family and medical leave may have meaningful consequences on health care, including health care costs, delivery, and efficacy, with macroeconomic results as well. For instance, researchers focused on the value of reducing infant mortality rates in the United States calculate a back-of-the-envelope figure suggesting that reducing infant mortality to the rate of Scandinavian countries would be worth approximately $84 billion annually. 118 Given the emerging literature suggesting the role that paid parental leave can play in reducing infant mortality, the economic “cost” of paid family and medical leave deserves to be reconsidered in terms of potential benefits using these new tools and techniques. Finally, paid caregiving leave may have important interactions with long-term care needs—an issue of growing importance as the U.S. population ages. Of course, paid leave will not solve the larger issue of long-term care needs in the United States—the challenges of long-term care in the context of an aging population and a broken health care system are well beyond the reach of any temporary paid family and medical leave policy. Yet providing caregivers with leave that allows for the coordination of an ill loved-one’s care may be an important piece of that puzzle, with ripple effects that touch not only the recipient of care and the caregiver but also the broader economy. Recent research on the impact of California’s paid leave policy on nursing home utilization finds that paid leave led to an 11 percent reduction in the share of the elderly residing in nursing homes. 119 While the study does not allow for a test of a specific mechanism connecting paid leave to nursing home utilization, the authors hypothesize that paid caregiving leave allows family members to provide timely care to aging relatives, which, in turn, reduces the need for long-term institutionalization. Specifically, access to temporary paid leave for caregiving may allow for timely, engaged responses to assist with rehabilitation from acute incidents (postsurgical rehabilitation and early interventions for dementia and Alzheimer’s), which, in turn, eliminates or delays the need for long-term institutional care. While the California study is a start, more research is needed on the connection between paid family and medical leave and the challenges that long-term care presents for both families and the nation’s fiscal outlook. The California study also highlights the need for access to meaningful data on a host of related issues underlying the questions involved. Connecting the dots between Medicaid usage and paid family leave was a substantial challenge for the authors and one that requires administrative data linking multiple program usage, medical outcomes, labor market outcomes, and demographics over a substantial period of time. This kind of longitudinal administrative data is far too rare, yet it is a prerequisite for developing the empirical knowledge base for understanding the complex relationships between public programs, family economic well-being, and broader economic outcomes. Data from the states suggest that the main source of demand for paid leave is not for parental leave but rather for medical leave to tend to one’s own serious illness. 123 If paid medical leave has similar labor supply effects as does parental leave for workers with health conditions across the life cycle, then the potential for large economic benefits through the labor supply channel is high. Looking ahead, researchers ought to focus on the long-term labor supply effects of paid medical leave in order to broaden the empirical evidence on whether and how paid leave to care for one’s own illness shapes labor force attachment and long-term earnings outcomes. The wide variety of types of conditions for which an individual worker might take a medical or caregiving leave means that researchers ought to pay particular attention to differing medical conditions, differing caregiving relationships, and the potential for demographic characteristics such as earnings, occupation, industry, geography, race, and age to shape outcomes. While this complex constellation of issues makes modelling the effects of medical or caregiving leave on growth a challenging exercise, continued attention to such issues is paramount. How does paid temporary medical leave interact with SSDI? Issues of particular interest include a focus on employment and earnings outcomes over the short, medium, and long term for individuals, as well as program finances and fiscal consequences. How does paid caregiving (and medical) leave shape long-term care needs, especially the implications for other public programs such as Medicaid and Medicare? How might paid leave play a role in helping ease the broader long-term care crisis in the United States, particuarly as the population ages? How does the intermittency of leave impact these programs? Among families with young children, how does paid parental leave impact use of the social safety net, including Medicaid, the Supplemental Nutrition Assistance Program, the Special Supplemental Nutrition Program for Women, Infants, and Children, or WIC, and other public programs? What are the most promising metrics for adequately capturing the economic benefits and costs of paid leave? Standard measures such as GDP and other catch-all measures for macroeconomic growth may miss out on important action, and alternate metrics (or disaggregated metrics for GDP) are important for researchers to consider. The tension between work responsibilities and caregiving responsibilities is not going away anytime soon in our country. Babies will continue to be born, workers will continue to become ill, and the aging population will continue to grow the demand for eldercare. The majority of families will not be able to count on a stay-at-home caregiver in the future. Many American women have been working and caring for families simultaneously for decades. Men are taking on a somewhat greater share of caregiving (and policy design may encourage that trend), but policymakers certainly shouldn’t expect men to fill the role that women once played as caregivers for both the young and old. Caregiving needs in the United States are shining a bright light on the threadbare parts of our existing safety net, and we are seeing the economic consequences of this daily. Existing academic literature already tells us a great deal about how paid leave for the full scope of caregiving needs can shape individuals, families, firms, and broader economic outcomes. Indeed, the knowledge base on parental leave is sufficient to have brought about a bipartisan, cross-ideological consensus on both the scope of the problem and the basic contours of a proposed federal policy solution for paid parental leave. 127 The same cannot be said for paid medical and caregiving leave, which highlights the need for additional research on these elements of the caregiving puzzle. 128 Despite that absence of consensus, a host of research suggests that the demand for both medical and caregiving leave is real. Moreover, multiple states have implemented successful policies to date, all utilizing the same social insurance-based model covering not only parental but also medical and caregiving leave. While the foundational research is strong, we have a great deal left to learn. Currently, the economics of paid leave are generally discussed in terms of costs, with the benefits of leave narrowly construed in individual or family outcomes. Yet these individual and family outcomes add up to a broader economic narrative—a host of promising research remains to be done in order to broaden the conversation, beginning with how paid leave could be defined as a public good, rather than a cost. Data needs remain a persistent concern for researchers invested in growing the knowledge about caregiving, access to leave from employers and public programs, and the wide range of outcomes detailed in the preceding pages. While access to longitudinal administrative data from state programs such as California’s has been a huge boon for the scholarship, those data are limited by their inability to link individual workers to others in their households, as well as by their absence of detailed demographic data and other issues. Existing data used to study leave-related questions is spread across multiple datasets for many interlocking outcomes, including health, labor, and broader economic outcomes. Data of firms and private benefits are often proprietary and difficult to access. Going forward, the Washington Center for Equitable Growth will be spearheading a concerted effort to catalogue data needs, a necessary condition for advancing the research. Much work remains to be done in order to better understand the full potential impact of paid family and medical leave on individuals, firms, and the economy as a whole, but policy need not wait for the perfect body of research. Indeed, existing social insurance programs such as Social Security provide a crucial safety net that has provided a basic modicum of income security for the American elderly and disabled for decades—and the designers of that program certainly weren’t insisting on an airtight evidence base before putting the policy in place. Of course, our ability to use data to understand problems and craft solutions has come a very long way since the New Deal, and the existing state programs have relied on that evidence to craft policies with substantial research informing their design. Those state programs have generated the ability to collect additional evidence, and the time is now for accelerating the research so that we can make the best policies possible. Elisabeth Jacobs is the senior director for Family Economic Security at the Washington Center for Equitable Growth. She oversees a broad array of work exploring the role of family economic well-being in creating stable, strong, broadly shared economic growth. Prior to her current role, Jacobs was responsible for building Equitable Growth’s academic research programs from the ground up, including the organization’s competitive grantmaking, off-cycle grants, commissions, Junior Fellows program, and institutional partnerships. Her own research agenda focuses on economic inequality and mobility, family economic security, poverty, employment, social policy, social insurance, and the politics of inequality. Her writing and commentary have been featured on National Public Radio, and in the Economist, the New York Times, the New Republic, the Atlantic, and other major media outlets. Prior to joining Equitable Growth, Jacobs was a fellow in Governance Studies at the Brookings Institution and a co-founder of Brookings’ popular Social Mobility Memos blog. Earlier in her career, she served as senior policy advisor to the Joint Economic Committee of the U.S. Congress and as an advisor to the U.S. Senate Committee on Health, Education, Labor and Pensions. She holds a doctorate and a master’s degree from Harvard University, where she was a fellow in the Multidisciplinary Program in Inequality and Social Policy at the Kennedy School of Government, and a bachelor’s degree from Yale University, where she served on the Board of Directors of Dwight Hall, the Center for Public Service and Social Justice. The author would like to extend her gratitude to Bridget Ansel and Alix Gould-Werth for their tireless research assistance; Raksha Kopparam for her exacting and enthusiastic fact-checking; Ed Paisley and the Washington Center for Equitable Growth Editorial team for their patience, wordsmithing, and design savvy; Amy Batchelor, Kathleen Romig, Vicki Shabo, and T.J. Sutcliffe for their nuts-and-bolts policy expertise; the members of the AEI-Brookings Working Group on Paid Leave; and Pivotal Ventures, an investment and incubation company created by Melinda Gates, for its support of Equitable Growth’s Paid Leave Accelerator. AEI-Brookings Working Group on Paid Family Leave. 2018. “The AEI-Brookings Working Group Report on Paid Family and Medical Leave: Charting a Path Forward.” Washington. AEI-Brookings Working Group on Paid Family Leave, and Isabel Sawhill. 2017. “Paid Family and Medical Leave: An Issue Whose Time Has Come.” Washington. Albelda, Randy, Michael Carr, and Emily Wiemers. 2018. “The Long-Run Impact of Temporary Disability Insurance on SSDI Claims, Earnings Stability, and Labor Force Participation.” Washington: Washington Center for Equitable Growth. American Academy of Pediatrics. 2005. “Breastfeeding and the Use of Human Milk.” Pediatrics 115 (2): 496–506. Appelbaum, Eileen, and Ruth Milkman. 2011. “Leaves That Pay: Employer and Worker Experiences with Paid Family Leave in California.” Washington: Center for Economic and Policy Research. Appelbaum, Eileen, Heather Boushey, and John Schmitt. 2014. “The Economic Importance of Women’s Rising Hours of Work.” Washington: Center for Economic and Policy Research and Center for American Progress. Arora, Kanika, and Douglas A. Wolf. 2018. “Does Paid Family Leave Reduce Nursing Home Use? The California Experience.” Journal of Policy Analysis and Management 37 (1): 38–62. Autor, David, and Mark Duggan. 2006. “The Growth in the Social Security Disability Rolls: A Fiscal Crisis Unfolding.” Working Paper. National Bureau of Economic Research. Autor, David, and Mark Duggan. 2010. “Supporting Work: A Proposal for Modernizing the U.S. Disability Insurance System.” Washington: Center for American Progress and The Hamilton Project. Avendano, Mauricio, and others. 2015. “The Long-Run Effect of Maternity Leave Benefits on Mental Health: Evidence from European Countries.” Social Science & Medicine 132: 45–53. Bana, Sarah, Kelly Bedard, and Maya Rossin-Slater. 2018. “The Impacts of Paid Family Leave Benefits: Regression Kink Evidence from California Administrative Data.” Working Paper. National Bureau of Economic Research. Bartel, Ann P., and others. 2016. “Assessing Rhode Island’s Temporary Caregiver Insurance Act: Insights from a Survey of Employers.” Washington: U.S. Department of Labor. Bartel, Ann P., and others. 2017. “Employer Attitudes Towards Paid Leave.” Stanford, CA: Stanford University. Bartel, Ann P., and others. 2018. “Paid Family Leave, Fathers’ Leave-Taking, and Leave-Sharing in Dual-Earner Households.” Journal of Policy Analysis and Management 37 (1): 10–37. Baum II, Charles L. 2003. “The Effects of Maternity Leave Legislation on Mothers’ Labor Supply after Childbirth.” Southern Economic Journal 69 (4): 772–99. Baum, Charles L., and Christopher J. Ruhm. 2016. “The Effects of Paid Family Leave in California on Labor Market Outcomes.” Journal of Policy Analysis and Management 35 (2): 333–56. Bedard, Kelly, and Maya Rossin-Slater. 2016. “The Economic and Social Impacts of Paid Family Leave in California: Report for the California Employment Development Department.” Sacremento, CA: California Employment Development Department. Bhuyan, Soumitra S., and others. 2016. “Paid Sick Leave Is Associated with Fewer ED Visits among US Private Sector Working Adults.” The American Journal of Emergency Medicine 34 (5): 784–89. Blau, Francine D., and Lawrence M. Kahn. 2013. 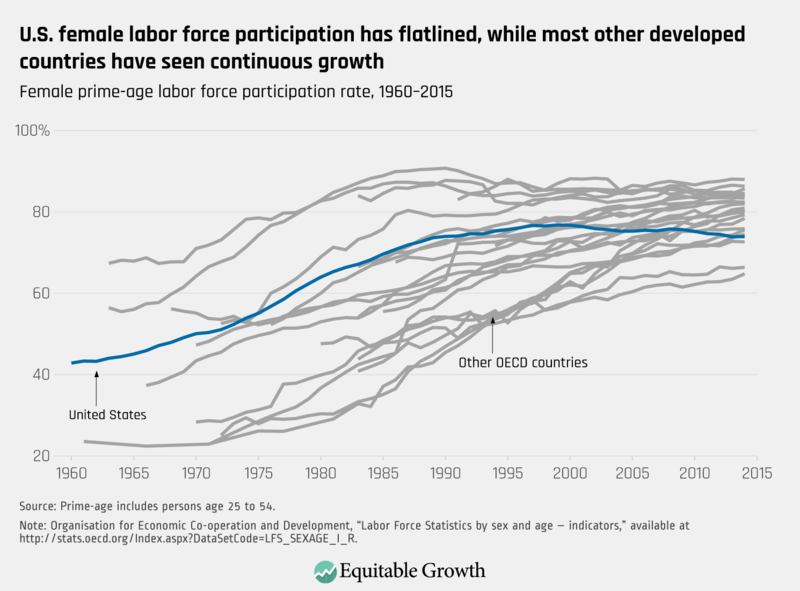 “Female Labor Supply: Why Is the US Falling Behind?” The American Economic Review 103 (3): 251–56. Bourbonniere, Annette M., and David R. Mann. 2018. “Benefit Duration and Return to Work Outcomes in Short Term Disability Insurance Programs: Evidence from Temporary Disability Insurance Program.” Journal of Occupational Rehabilitation. Boushey, Heather, and Austin Clemons. 2018. “Disaggregating Growth.” Washington: Washington Center for Equitable Growth. Boushey, Heather, and Sarah Jane Glynn. 2012. “There Are Significant Costs to Replacing Employees.” Washington: Center for American Progress. Braveman, Paula A., and others. 2010. “Socioeconomic Disparities in Health in the United States: What the Patterns Tell Us.” American Journal of Public Health 100 (S1): S186–96. Butrica, Barbara, and Nadia Karamcheva. 2014. “The Impact of Informal Caregiving on Older Adults’ Labor Supply and Economic Resources.” Washington: Urban Institute. Byker, Tanya. 2014. “The Role of Paid Parental Leave in Reducing Women’s Career Interruptions: Evidence from Paid Leave Laws in California and New Jersey.” Ann Arbor, MI: University of Michigan. ———. 2016. “Paid Parental Leave Laws in the United States: Does Short-Duration Leave Affect Women’s Labor-Force Attachment?” American Economic Review 106 (5): 242–46. Cantor, David, and others. 2001. “Balancing the Needs of Families and Employers: Family and Medical Leave Surveys, 2000 Update.” Rockville, MD: Westat. Chatterji, Pinka, and Sara Markowitz. 2008. “Family Leave after Childbirth and the Health of New Mothers.” Working Paper. National Bureau of Economic Research. Chen, Alice, Emily Oster, and Heidi Williams. 2016. “Why Is Infant Mortality Higher in the United States Than in Europe?” American Economic Journal: Economic Policy 8 (2): 89–124. Chen, Mei-Lan. 2016. “The Growing Costs and Burden of Family Caregiving of Older Adults: A Review of Paid Sick Leave and Family Leave Policies.” The Gerontologist 56 (3): 391–96. Chowdhury, R., and others. 2015. “Breastfeeding and Maternal Health Outcomes: A Systematic Review and Meta-Analysis.” Acta Paediatrica 104 (467): 96–113. Das, Tirthatanmoy, and Solomom W. Polacheck. 2014. “Unanticipated Effects of California’s Paid Family Leave Program.” Bonn, Germany: Institute for the Study of Labor (IZA). DePillis, Lydia. 2015. “What Netflix’s New Maternity Leave Policy Doesn’t Tell Us about Inequality.” Washington Post, September 1, sec. Wonkblog. DeRigne, LeaAnne, and others. 2017. “Paid Sick Leave and Preventive Health Care Service Use Among U.S. Working Adults.” Preventative Medicine 99: 58–62. Diversitydatakids.org. n.d. “Inequities in Eligibility for FMLA Leave.” Brandeis University Heller School for Social Policy and Management (http://www.diversitydatakids.org/files/Policy/FMLA/Capacity/Inequities%20in%20FMLA%20eligibility.pdf [October 9, 2018]). Donovan, Sarah. 2018. “Paid Family Leave in the United States.” Washington: Congressional Research Service. Earle, Alison, and Jody Heymann. 2011. “Protecting the Health of Employees Caring for Family Members with Special Health Care Needs.” Social Science & Medicine (1982) 73 (1): 68–78. Earle, Alison, S. Jody Heymann, and John Z. Ayanian. 2006. “Work Resumption after Newly Diagnosed Coronary Heart Disease: Findings on the Importance of Paid Leave.” Journal of Women’s Health 15 (4): 430–41. Employment Development Department. n.d. “Disability Insurance Program Statistics.” State of California. Employment Development Department. n.d. “Paid Family Leave (PFL) Program Statistics.” State of California. Engeman, Cassandra D. 2012. “Ten Years of the California Paid Family Leave Program.” Santa Barbara, CA: Center for the Study of Work, Labor and Democracy at the University of California, Santa Barbara. Feinberg, Lynn. 2013. “Keeping Up with the Times: Supporting Family Caregivers with Workplace Leave Policies.” Washington: AARP Public Policy Institute. Goldin, Claudia. 1986. “The Female Labor Force and American Economic Growth, 1890-1980.” In Long-Term Factors in American Economic Growth. Chicago, IL: University of Chicago Press. Goldin, Claudia, and Joshua Mitchell. 2016. “The New Lifecycle of Women’s Employment: Disappearing Humps, Sagging Middles, Expanding Tops.” Working Paper. National Bureau of Economic Research. ———. 2017. “The New Life Cycle of Women’s Employment: Disappearing Humps, Sagging Middles, Expanding Tops.” Journal of Economic Perspectives 31 (1): 161–82. Han, Wen-Jui, Christopher Ruhm, and Jane Waldfogel. 2009. “Parental Leave Policies and Parents’ Employment and Leave Taking.” Journal of Policy Analysis and Management 28: 29–54. Han, Wen-Jui, and Jane Waldfogel. 2003. “Parental Leave: The Impact of Recent Legislation on Parents’ Leave Taking.” Demography 40 (1): 191–200. Helman, Ruth, Craig Copeland, and Jack VanDerhei. 2015. “The 2015 Retirement Confidence Survey: Having a Retirement Savings Plan a Key Factor in Americans’ Retirement Confidence.” Washington: Employee Benefit Research Institute. Hofferth, Sandra. 1996. “Effects of Public and Private Policies on Working after Childbirth.” Work and Occupations 23 (4): 378–404. Horowitz, Juliana, and others. 2017. “Americans Widely Support Paid Family and Medical Leave, but Differ Over Specific Policies.” Washington: Pew Research Center. Horta, Bernardo L., and World Health Organization. 2007. Evidence on the Long-Term Effects of Breastfeeding: Systematic Reviews and Meta-Analyses. Geneva: World Health Organization. House, James S., and others. n.d. “The Social Stratification of Aging and Health.” Journal of Health and Social Behavior 35 (3): 213–34. Houser, Linda, and Thomas P. Vartanian. 2012. “Pay Matters: The Positive Economic Impacts of Paid Family Leave for Families, Businesses and the Public.” New Brunswick, NJ: Center for Women and Work. Huang, Rui, and Muzhe Yang. 2015. “Paid Maternity Leave and Breastfeeding Practice before and after California’s Implementation of the Nation’s First Paid Family Leave Program.” Economics and Human Biology 16: 45–59. Jacobs, Elisabeth. 2018. “California’s Paid Family Leave Policy Is Decreasing Nursing Home Use and Saving Medicaid Dollars.” Washington Center for Equitable Growth, July 9, Value Added blog (https://equitablegrowth.org/californias-paid-family-leave-policy-is-decreasing-nursing-home-use-and-saving-medicaid-dollars/ [October 9, 2018]). Jennifer L. Glass, and Lisa Riley. 1998. “Family Responsive Policies and Employee Retention Following Childbirth.” Social Forces 76 (4): 1401–35. Klerman, Jacob Alex, Kelly Daley, and Alyssa Pozniak. 2012. “Family and Medical Leave in 2012: Technical Report.” Cambridge, MA: Abt Associates Inc.
Klevens, Joanne, and others. 2016. “Paid Family Leave’s Effect on Hospital Admissions for Pediatric Abusive Head Trauma.” Injury Prevention: Journal of the International Society for Child and Adolescent Injury Prevention 22 (6): 442–45. Levine, Carol, and others. 2010. “Bridging Troubled Waters: Family Caregivers, Transitions, And Long-Term Care.” Health Affairs 29 (1): 116–24. Lichtman-Sadot, Shirlee, and Neryvia Pillay Bell. 2017. “Child Health in Elementary School Following California’s Paid Family Leave Program.” Journal of Policy Analysis and Management 36 (4): 790–827. Lindner, Stephan, and Austin Nichols. 2012. “The Impact of Temporary Assistance Programs on Disability Rolls and Re-Employment.” Chestnut Hill, MA: Boston College Center for Retirement Research. Maestas, Nicole, Kathleen J. Mullen, and Alexander Strand. 2013. “Does Disability Insurance Receipt Discourage Work? Using Examiner Assignment to Estimate Causal Effects of SSDI Receipt.” American Economic Review 103 (5): 1797–1829. Mather, Mark, Linda A Jacobsen, and Kelvin M. Pollard. 2015. “Aging in the United States.” Population Bulletin 70 (2). Meyer, Bruce D., and Wallace K. C. Mok. 2013. “Disability, Earnings, Income and Consumption.” Working Paper. National Bureau of Economic Research. Moore, Mary Lou. 2001. “Current Research Continues to Support Breastfeeding Benefits.” The Journal of Perinatal Education 10 (3): 38–41. Morrisey, Taryn. 2017. “Child Care and Parent Labor Force Participation: A Review of the Research Literature.” Review of Economics of the Household 15 (1): 1–24. Nandi, Arijit, and others. 2016. “Increased Duration of Paid Maternity Leave Lowers Infant Mortality in Low- and Middle-Income Countries: A Quasi-Experimental Study.” PLOS Medicine 13 (3): e1001985. National Academies of Sciences, Engineering, and Medicine. 2016. Families Caring for an Aging America. Washington: National Academies Press. National Alliance for Caregiving. 2015. “Caregiving in the U.S. 2015.” Bethesda, MD. National Partnership for Women and Families. 2018. “State Paid Family and Medical Leave Insurance Laws.” Washington. National Conference of State Legislatures. 2018. “Paid Sick Leave.” Washington. Nauert, Rick. 2011. “Caregivers Face Emotional and Financial Stress.” Psych Central. September 22. Office of Legislative Services. 2017. “Analysis of the New Jersey Budget: Department of Labor and Workforce Development FY2017-2018.” New Jersey State Legislature. Office of Research and Information. 2017. “Family Leave Insurance Workload in 2016: Summary Report.” New Jersey Department of Labor and Workforce Development. Office of Research and Information. 2017. “Temporary Disability Insurance Workload in 2016: Summary Report.” New Jersey Department of Labor and Workforce Development. Olivetti, Claudia, and Barbara Petrongolo. 2017. “The Economic Consequences of Family Policies: Lessons from a Century of Legislation in High-Income Countries.” Journal of Economic Perspectives 31 (1): 205–30. Parker, Kim, and Gretchen Livingston. 2018. “7 Facts About American Dads.” Washington: Pew Research Center. Patnaik, Ankita. 2019. “Reserving Time for Daddy: The Consequences of Fathers’ Quotas.” Journal of Labor Economics (forthcoming). Reinhard, Susan C., and others. 2015. “Valuing the Invaluable: 2015 Update.” Washington: AARP Public Policy Institute. Rossin-Slater, Maya. 2011. “The Effects of Maternity Leave on Children’s Birth and Infant Health Outcomes in the United States.” Journal of Health Economics 30 (2): 221–39. ———. 2018. “Maternity and Family Leave Policy.” In Oxford Handbook on the Economics of Women. Oxford, UK: Oxford University Press. Rossin-Slater, Maya, Christopher J. Ruhm, and Jane Waldfogel. 2011. “The Effects of California’s Paid Family Leave Program on Mothers’ Leave-Taking and Subsequent Labor Market Outcomes.” Working Paper. National Bureau of Economic Research. Ruhm, Christopher J. 2000. “Parental Leave and Child Health.” Journal of Health Economics 19: 931–930. ———. 2018. “Deaths of Despair or Drug Problems?” Working Paper. National Bureau of Economic Research. Saad-Lessler, Joelle, and Kate Bahn. 2017. “The Importance of Paid Leave for Caregivers.” Washington: Center for American Progress. Schulz, Richard, and Paula R. Sherwood. 2008. “Physical and Mental Health Effects of Family Caregiving.” The American Journal of Nursing 108 (9 Suppl): 23–27. Schuster, Mark A., and others. 2009. “Perceived Effects of Leave From Work and the Role of Paid Leave Among Parents of Children With Special Health Care Needs.” American Journal of Public Health 99 (4): 698–705. Schwabish, Jonathan A. 2016. “11 Charts about the Social Security Disability Insurance Program.” Washington: Urban Institute. Sethna, Vaheshta, and others. 2017. “Father–Child Interactions at 3 Months and 24 Months: Contributions to Children’s Cognitive Development at 24 Months.” Infant Mental Health Journal 38 (3): 378–90. Silver, Barbara E., Helen Mederer, and Emilija Djurdjevic. 2016. “Launching the Rhode Island Temporary Caregiver Insurance Program (TCI): Employee Experiences One Year Later.” Washington: U.S. Department of Labor Women’s Bureau. Social Policy Division – Directorate of Employer, Labour and Social Affairs. n.d. “OECD Family Database.” Organisation for Economic Co-operation and Development (http://www.oecd.org/els/family/database.htm [June 29, 2018]). Spivey, Christy. 2005. “Time off at What Price? The Effects of Career Interruptions on Earnings.” ILR Review 59 (1): 119–40. Stearns, Jenna. 2016. “The Long-Run Effects of Wage Replacement and Job Protection: Evidence from Two Maternity Leave Reforms in Great Britain.” SSRN. Tanaka, Sakiko. 2005. “Parental Leave and Child Health Across OECD Countries.” Economic Journal 115 (501): F7–28. Thoits, Peggy A. 2010. “Stress and Health: Major Findings and Policy Implications.” Journal of Health and Social Behavior 51 (1_suppl): S41–53. Tisinger, Russell, and others. 2016. “Understanding Attitudes on Paid Family Leave: Discussions with Parents and Caregivers in California, New Jersey and Rhode Island.” Washington: U.S. Department of Labor. U.S. Bureau of Labor Statistics. 2012. National Compensation Survey, Table 32. Leave Benefits: Access, Private Industry Workers. U.S. Department of Labor. U.S. Bureau of Labor Statistics. 2017. National Compensation Survey: Employee Benefits in the United States, March 2017. U.S Department of Labor. U.S Bureau of Labor Statitics. 2017. National Compensation Survey: Employee Benefits in the United States, March 2017. Bulletin 2787. U.S. Department of Labor. U.S. Equal Employment Opportunity Commission. n.d. “Pregnancy Discrimination.” (http://www.eeoc.gov/laws/types/pregnancy.cfm [October 3, 2018]). Waldfogel, Jane. 1999. “Family Leave Coverage in the 1990s.” Monthly Labor Review 10: 13–21. ———. 1999. “The Impact of the Family and Medical Leave Act.” Journal of Policy Analysis and Management 18: 281–303. Wilson, Fernando A., Yang Wang, and Jim P. Stimpson. 2014. “Universal Paid Leave Increases Influenza Vaccinations among Employees in the U.S.” Vaccine 32 (21): 2441–45. 1 Birth statistics are a computed daily average based on annual data for 2016 from the National Center for Health Statistics at the Centers for Disease Control and Prevention. Cancer statistics are a computed daily average based on annual data for 2018 from the National Cancer Institute at the National Institutes of Health. Alzheimer’s statistics are a computed daily average based on annual data from 2017 from the Alzheimer’s Association. See: “National Center for Health Statistics: Births and Natality,” available at https://www.cdc.gov/nchs/fastats/births.htm (last accessed October 9, 2018); “Cancer Statistics,” available at https://www.cancer.gov/about-cancer/understanding/statistics (last accessed October 9, 2018); “Alzheimer’s Facts and Figures,” available at https://www.alz.org/alzheimers-dementia/facts-figures (last accessed October 9, 2018). 2 In the private sector, FMLA protections apply only to employers with 50 or more employees within 75 miles of the workplace and to employees who have worked for a given employer for no less than 12 months and for at least 1,250 hours in the past year. The business size and job tenure exclusions mean that many working parents and women of child-bearing age are excluded from FMLA coverage. See: “Inequities in Eligibility for FMLA Leave, available at http://www.diversitydatakids.org/files/Policy/FMLA/Capacity/Inequities%20in%20FMLA%20eligibility.pdf (last accessed October 9, 2018). 3 Juliana Horowitz and others, “Americans Widely Support Paid Family and Medical Leave, but Differ Over Specific Policies” (Washington: Pew Research Center, 2017). 4 Sarah Donovan, “Paid Family Leave in the United States” (Washington: Congressional Research Service, 2018), available at https://fas.org/sgp/crs/misc/R44835.pdf. 5 U.S. Bureau of Labor Statistics, National Compensation Survey, Table 32. Leave Benefits: Access, Private Industry Workers (U.S. Department of Labor, 2012), available at http://www.bls.gov/ncs/ebs/benefits/2012/ownership/private/table21a.pdf. 6 U.S. Bureau of Labor Statistics, National Compensation Survey: Employee Benefits in the United States, March 2017 (U.S Department of Labor, 2017), Table 16. Insurance Benefits: Access, Participation, and Take-Up Rates, March 2017. 8 “State Paid Family and Medical Leave Insurance Laws,” available at http://www.nationalpartnership.org/research-library/work-family/paid-leave/state-paid-family-leave-laws.pdf (last accessed October 9, 2018). 9 “Paid Family Leave State Legislative Tracker,” available at http://paidleave.us/statetracker/ (last accessed October 9, 2018). 10 “OECD Family Database,” available at http://www.oecd.org/els/family/database.htm (last accessed October 9, 2018). 11 Jane Waldfogel, “The Impact of the Family and Medical Leave Act,” Journal of Policy Analysis and Management 18 (1999): 281–303; Wen-Jui Han and Jane Waldfogel, “Parental Leave: The Impact of Recent Legislation on Parents’ Leave Taking,” Demography 40 (1) (2003): 191–200. 12 Han and Waldfogel, “Parental Leave”; Jane Waldfogel, “Family Leave Coverage in the 1990s,” Monthly Labor Review 10 (1999): 13–21; Wen-Jui Han, Christopher Ruhm, and Jane Waldfogel, “Parental Leave Policies and Parents’ Employment and Leave Taking,” Journal of Policy Analysis and Management 28 (2009): 29–54. 14 Jennifer L. Glass and Lisa Riley, “Family Responsive Policies and Employee Retention Following Childbirth,” Social Forces 76 (4) (1998): 1401–35; Sandra Hofferth, “Effects of Public and Private Policies on Working after Childbirth,” Work and Occupations 23 (4) (1996): 378–404. 15 Sandra Hofferth, “Effects of Public and Private Policies on Working after Childbirth,” Work and Occupations 23 (4) (1996): 378–404; Jennifer L. Glass and Lisa Riley, “Family Responsive Policies and Employee Retention Following Childbirth,” Social Forces 76 (4) (1998): 1401–35. 16 Christy Spivey, “Time off at What Price? The Effects of Career Interruptions on Earnings,” ILR Review 59 (1) (2005): 119–40. 17 Tanya Byker, “Paid Parental Leave Laws in the United States: Does Short-Duration Leave Affect Women’s Labor-Force Attachment?” American Economic Review 106 (5) (2016): 242–46. 18 Cassandra D. Engeman, “Ten Years of the California Paid Family Leave Program” (Santa Barbara, CA: Center for the Study of Work, Labor and Democracy, University of California, Santa Barbara, 2012), available at http://www.femst.ucsb.edu/projects/crwsj/engagements/pdf/Engeman-PFL-Policy-Brief.pdf; Taryn Morrisey, “Child Care and Parent Labor Force Participation: A Review of the Research Literature,” Review of Economics of the Household 15 (1) (2017): 1–24. 19 Charles L. Baum and Christopher J. Ruhm, “The Effects of Paid Family Leave in California on Labor Market Outcomes,” Journal of Policy Analysis and Management 35 (2) (2016): 333–56. 20 Ibid. ; Maya Rossin-Slater, Christopher J. Ruhm, and Jane Waldfogel, “The Effects of California’s Paid Family Leave Program on Mothers’ Leave-Taking and Subsequent Labor Market Outcomes.” Working Paper (National Bureau of Economic Research, 2011). 21 Kelly Bedard and Maya Rossin-Slater, “The Economic and Social Impacts of Paid Family Leave in California: Report for the California Employment Development Department” (Sacramento, CA: California Employment Development Department, 2016), available at http://www.edd.ca.gov/Disability/pdf/PFL_Economic_and_Social_Impact_Study.pdf. 22 Sarah Bana, Kelly Bedard, and Maya Rossin-Slater, “The Impacts of Paid Family Leave Benefits: Regression Kink Evidence from California Administrative Data.” Working Paper (National Bureau of Economic Research, 2018), available at http://www.nber.org/papers/w24438. 23 Ann P. Bartel and others, “Paid Family Leave, Fathers’ Leave-Taking, and Leave-Sharing in Dual-Earner Households,” Journal of Policy Analysis and Management 37 (1) (2018): 10–37, available at https://doi.org/10.1002/pam.22030. 25 While paid leave may help close the gender pay gap, in the absence of shifts in attitudes, it may also exacerbate it by shifting labor demand away from women of child-bearing age. Some suggestive evidence exists to this end, including one study that finds that young women’s unemployment rate and duration of unemployment spells rose in California as compared to states without paid leave laws in place. Tirthatanmoy Das and Solomom W. Polacheck, “Unanticipated Effects of California’s Paid Family Leave Program.” IZA Discussion Paper (Bonn, Germany: Institute for the Study of Labor, 2014). 26 Ankita Patnaik, “Reserving Time for Daddy: The Consequences of Fathers’ Quotas,” Journal of Labor Economics (2019) (forthcoming), available at https://papers.ssrn.com/sol3/papers.cfm?abstract_id=3225239. 27 Jenna Stearns, “The Long-Run Effects of Wage Replacement and Job Protection: Evidence from Two Maternity Leave Reforms in Great Britain,” SSRN (2016), available at https://papers.ssrn.com/sol3/papers.cfm?abstract_id=3030808. 28 Note that leave-takers who are covered by the FMLA have job protection, but the more expansive eligibility criteria for state programs means that many workers who are not FMLA-eligible are nonetheless covered by their state’s paid leave program. 30 Lynn Feinberg, “Keeping Up with the Times: Supporting Family Caregivers with Workplace Leave Policies” (Washington: AARP Public Policy Institute, 2013), available at https://www.aarp.org/home-family/caregiving/info-06-2013/supporting-family-caregivers-with-workplace-leave-policies-AARP-ppi-ltc.html. 31 Joelle Saad-Lessler and Kate Bahn, “The Importance of Paid Leave for Caregivers” (Washington: Center for American Progress, 2017), available at https://www.americanprogress.org/issues/women/reports/2017/09/27/439684/importance-paid-leave-caregivers/. 32 Barbara Butrica and Nadia Karamcheva, “The Impact of Informal Caregiving on Older Adults’ Labor Supply and Economic Resources” (Washington: Urban Institute, 2014). 33 National Academies of Sciences, Engineering, and Medicine, Families Caring for an Aging America (Washington: National Academies Press, 2016). See especially chapter four. 35 Jacob Alex Klerman, Kelly Daley, and Alyssa Pozniak, “Family and Medical Leave in 2012: Technical Report” (Cambridge, MA: Abt Associates Inc., 2012), available at http://www.dol.gov/asp/evaluation/fmla/FMLA-2012-Technical-Report.pdf. 36 See, for example, Alison Earle, S. Jody Heymann, and John Z. Ayanian, “Work Resumption after Newly Diagnosed Coronary Heart Disease: Findings on the Importance of Paid Leave,” Journal of Women’s Health 15 (4) (2006): 430–41. 37 Annette M. Bourbonniere and David R. Mann, “Benefit Duration and Return to Work Outcomes in Short Term Disability Insurance Programs: Evidence from Temporary Disability Insurance Program,” Journal of Occupational Rehabilitation (2018), available at https://doi.org/10.1007/s10926-018-9779-5. 38 Arijit Nandi and others, “Increased Duration of Paid Maternity Leave Lowers Infant Mortality in Low- and Middle-Income Countries: A Quasi-Experimental Study,” PLOS Medicine 13 (3) (2016): e1001985, available at https://doi.org/10.1371/journal.pmed.1001985. 39 Sakiko Tanaka, “Parental Leave and Child Health Across OECD Countries,” Economic Journal 115 (501) (2005): F7–28; Christopher J. Ruhm, “Parental Leave and Child Health,” Journal of Health Economics 19 (2000): 931–930; Maya Rossin-Slater, “Maternity and Family Leave Policy.” In Oxford Handbook on the Economics of Women (Oxford, UK: Oxford University Press, 2018), available at https://www.nber.org/papers/w23069.pdf. 41 Maya Rossin-Slater, “The Effects of Maternity Leave on Children’s Birth and Infant Health Outcomes in the United States,” Journal of Health Economics 30 (2) (2011): 221–39, available at https://doi.org/10.1016/j.jhealeco.2011.01.005. 42 The U.S. ranks 51st in infant deaths internationally, tied with Croatia, yet U.S. GDP is about three times that of Croatia. Another way of thinking about the statistic is to consider that U.S. infant mortality rates are about 3 deaths per 1000 greater than in Scandinavian countries. Alice Chen, Emily Oster, and Heidi Williams, “Why Is Infant Mortality Higher in the United States Than in Europe?” American Economic Journal: Economic Policy 8 (2) (2016): 89–124. 43 Joanne Klevens and others, “Paid Family Leave’s Effect on Hospital Admissions for Pediatric Abusive Head Trauma,” Injury Prevention: Journal of the International Society for Child and Adolescent Injury Prevention 22 (6) (2016): 442–45, available at https://doi.org/10.1136/injuryprev-2015-041702. 44 Rui Huang and Muzhe Yang, “Paid Maternity Leave and Breastfeeding Practice before and after California’s Implementation of the Nation’s First Paid Family Leave Program,” Economics and Human Biology 16 (2015): 45–59, available at https://doi.org/10.1016/j.ehb.2013.12.009. 45 For a survey of the literature, see Mary Lou Moore, “Current Research Continues to Support Breastfeeding Benefits,” The Journal of Perinatal Education 10 (3) (2001): 38–41, available at https://doi.org/10.1624/105812401X88327; Bernardo L Horta and World Health Organization, Evidence on the Long-Term Effects of Breastfeeding: Systematic Reviews and Meta-Analyses (Geneva: World Health Organization, 2007). 46 Shirlee Lichtman-Sadot and Neryvia Pillay Bell, “Child Health in Elementary School Following California’s Paid Family Leave Program,” Journal of Policy Analysis and Management 36 (4) (2017): 790–827, available at https://doi.org/10.1002/pam.22012. 47 Vaheshta Sethna and others, “Father–Child Interactions at 3 Months and 24 Months: Contributions to Children’s Cognitive Development at 24 Months,” Infant Mental Health Journal 38 (3) (2017): 378–90, available at https://doi.org/10.1002/imhj.21642. 49 “Pregnancy Discrimination,” available at http://www.eeoc.gov/laws/types/pregnancy.cfm (last accessed October 3, 2018). 50 Pinka Chatterji and Sara Markowitz, “Family Leave after Childbirth and the Health of New Mothers.” Working Paper (National Bureau of Economic Research, 2008), available at https://doi.org/10.3386/w14156. 51 For a review of potential mechanisms and additional citations, see Mauricio Avendano and others, “The Long-Run Effect of Maternity Leave Benefits on Mental Health: Evidence from European Countries,” Social Science & Medicine 132 (2015): 45–53, available at https://doi.org/10.1016/j.socscimed.2015.02.037. 52 Mauricio Avendano and others, “The Long-Run Effect of Maternity Leave Benefits on Mental Health: Evidence from European Countries,” Social Science & Medicine 132 (2015): 45–53, available at https://doi.org/10.1016/j.socscimed.2015.02.037. 54 American Academy of Pediatrics, “Breastfeeding and the Use of Human Milk,” Pediatrics 115 (2) (2005): 496–506, available at https://doi.org/doi:10.1542/peds.2004-2491; R. Chowdhury and others, “Breastfeeding and Maternal Health Outcomes: A Systematic Review and Meta-Analysis,” Acta Paediatrica 104 (467) (2015): 96–113. 57 “Temporary Disability Insurance Workload in 2016 Summary Report,” available at http://www.nj.gov/labor/forms_pdfs/tdi/TDI%20Report%20for%202016.pdf (last accessed October 9, 2018). 58 U.S. Bureau of Labor Statistics, National Compensation Survey: Employee Benefits in the United States, March 2017. 60 Paula A. Braveman and others, “Socioeconomic Disparities in Health in the United States: What the Patterns Tell Us,” American Journal of Public Health 100 (S1) (2010): S186–96, available at https://doi.org/10.2105/AJPH.2009.166082; James S. House and others, “The Social Stratification of Aging and Health,” Journal of Health and Social Behavior 35 (3) (n.d.): 213–34. 62 Fernando A. Wilson, Yang Wang, and Jim P. Stimpson, “Universal Paid Leave Increases Influenza Vaccinations among Employees in the U.S.,” Vaccine 32 (21) (2014): 2441–45. 63 “Paid Sick Leave,” available at http://www.ncsl.org/research/labor-and-employment/paid-sick-leave.aspx (last accessed October 9, 2018). 64 Peggy A. Thoits, “Stress and Health: Major Findings and Policy Implications,” Journal of Health and Social Behavior 51 (1_suppl) (2010): S41–53, available at https://doi.org/10.1177/0022146510383499. 65 Richard Schulz and Paula R. Sherwood, “Physical and Mental Health Effects of Family Caregiving,” The American Journal of Nursing 108 (9 Suppl) (2008): 23–27, available at https://doi.org/10.1097/01.NAJ.0000336406.45248.4c. 66 National Alliance for Caregiving, “Caregiving in the U.S. 2015” (2015), available at http://www.caregiving.org/wp-content/uploads/2015/05/2015_CaregivingintheUS_Final-Report-June-4_WEB.pdf. 67 Rick Nauert, “Caregivers Face Emotional and Financial Stress,” Psych Central, September 22, 2011, available at https://psychcentral.com/news/2011/09/22/caregivers-face-emotional-and-financial-stress/29694.html. 68 Mei-Lan Chen, “The Growing Costs and Burden of Family Caregiving of Older Adults: A Review of Paid Sick Leave and Family Leave Policies,” The Gerontologist 56 (3) (2016): 391–96, available at https://doi.org/10.1093/geront/gnu093. 69 Mark A. Schuster and others, “Perceived Effects of Leave From Work and the Role of Paid Leave Among Parents of Children With Special Health Care Needs,” American Journal of Public Health 99 (4) (2009): 698–705, available at https://doi.org/10.2105/AJPH.2008.138313. 70 Alison Earle and Jody Heymann, “Protecting the Health of Employees Caring for Family Members with Special Health Care Needs,” Social Science & Medicine (1982) 73 (1) (2011): 68–78, available at https://doi.org/10.1016/j.socscimed.2011.05.016. 71 Russell Tisinger and others, “Understanding Attitudes on Paid Family Leave: Discussions with Parents and Caregivers in California, New Jersey and Rhode Island” (Washington: U.S. Department of Labor, 2016), available at https://www.dol.gov/asp/evaluation/completed-studies/Paid_Leave_AwarenessBenefitsBarriers.pdf. 72 Mark Mather, Linda A Jacobsen, and Kelvin M. Pollard, “Aging in the United States,” Population Bulletin 70 (2) (2015), available at https://www.prb.org/wp-content/uploads/2016/01/aging-us-population-bulletin-1.pdf. 74 Carol Levine and others, “Bridging Troubled Waters: Family Caregivers, Transitions, And Long-Term Care,” Health Affairs 29 (1) (2010): 116–24, available at https://doi.org/10.1377/hlthaff.2009.0520. 75 Lydia DePillis, “What Netflix’s New Maternity Leave Policy Doesn’t Tell Us about Inequality,” Washington Post, September 1, 2015, available at https://www.washingtonpost.com/news/wonk/wp/2015/09/01/netflixs-much-criticized-maternity-leave-policy-is-actually-pretty-rare/?noredirect=on&utm_term=.e0af0287f0b7. Note that after public outcry, Netflix extended leave benefits to their line workers as well. 76 U.S Bureau of Labor Statistics, National Compensation Survey: Employee Benefits in the United States, March 2017 (U.S. Department of Labor, 2017), Bulletin 2787, available at https://www.bls.gov/ncs/ebs/benefits/2017/ebbl0061.pdf. 77 Ann P. Bartel and others, “Employer Attitudes Towards Paid Leave” (Stanford, CA: Stanford University, 2017), available at http://web.stanford.edu/~mrossin/Bartel_et_al_EmployerAttitudesReport_Aug2017.pdf. 78 Note that in New Jersey, paid medical leave is jointly financed between employers and employees. See Office of Legislative Services of the New Jersey State Legislature, “Analysis of the New Jersey Budget: Department of Labor and Workforce Development FY2017-2018” (2017), available at https://www.njleg.state.nj.us/legislativepub/budget_2018/DOL_analysis_2018.pdf. 79 Eileen Appelbaum and Ruth Milkman, “Leaves That Pay: Employer and Worker Experiences with Paid Family Leave in California” (Washington: Center for Economic and Policy Research, 2011), available at http://www.cepr.net/documents/publications/paid-family-leave-1-2011.pdf. 80 Ann Bartel and others, “Assessing Rhode Island’s Temporary Caregiver Insurance Act: Insights from a Survey of Employers” (Washington: U.S. Department of Labor, 2016), available at https://www.dol.gov/asp/evaluation/completed-studies/AssessingRhodeIslandTemporaryCaregiverInsuranceAct_InsightsFromSurveyOfEmployers.pdf. 85 Heather Boushey and Sarah Jane Glynn, “There Are Significant Costs to Replacing Employees” (Washington: Center for American Progress, 2012), available at http://www.americanprogress.org/issues/labor/report/2012/11/16/44464/there-are-significant-business-costs-to-replacing-employees/. 87 Bartel and others, “Employer Attitudes Towards Paid Leave”; Appelbaum and Milkman, “Leaves That Pay”; Barbara E. Silver, Helen Mederer, and Emilija Djurdjevic, “Launching the Rhode Island Temporary Caregiver Insurance Program (TCI): Employee Experiences One Year Later” (Washington: U.S. Department of Labor Women’s Bureau, 2016), available at https://www.dol.gov/wb/media/RI_paid_leave_report.pdf. 93 Benjamin U. Friedrich and Martin B. Hackmann, “The Returns to Nursing: Evidence from a Parental Leave Program,” Working Paper (National Bureau of Economic Research, 2017), available at https://doi.org/10.3386/w23174. 94 Wen-Jui Han, Christopher Ruhm, and Jane Waldfogel, “Parental Leave Policies and Parents’ Employment and Leave-Taking,” Journal of Policy Analysis and Management 28 (1) (2009): 29–54, available at https://doi.org/10.1002/pam.20398. 95 Author’s calculations from New Jersey state program data. See Jonathan A. Schwabish, “11 Charts about the Social Security Disability Insurance Program” (Washington: Urban Institute, 2016), available at https://www.urban.org/features/11-charts-about-social-security-disability-insurance-program. 97 Claudia Goldin, “The Female Labor Force and American Economic Growth, 1890-1980.” In Long-Term Factors in American Economic Growth (Chicago, IL: University of Chicago Press, 1986). 98 Claudia Goldin and Joshua Mitchell, “The New Lifecycle of Women’s Employment: Disappearing Humps, Sagging Middles, Expanding Tops.” Working Paper (National Bureau of Economic Research, 2016), available at https://doi.org/10.3386/w22913. 100 Claudia Olivetti and Barbara Petrongolo, “The Economic Consequences of Family Policies: Lessons from a Century of Legislation in High-Income Countries,” Journal of Economic Perspectives 31 (1) (2017): 205–30, available at https://doi.org/10.1257/jep.31.1.205. 105 Kim Parker and Gretchen Livingston, “7 Facts About American Dads” (Washington: Pew Research Center, 2018), available at http://www.pewresearch.org/fact-tank/2018/06/13/fathers-day-facts/. 106 Rhode Island passed the first TDI law in 1942; California followed in 1946; New Jersey in 1948; New York in 1949; Puerto Rico in 1968; and Hawaii in 1969. 107 The Washington Center for Equitable Growth recently provided funding support to a research project investigating a related set of questions. See Randy Albelda, Michael Carr, and Emily Wiemers, “The Long-Run Impact of Temporary Disability Insurance on SSDI Claims, Earnings Stability, and Labor Force Participation” (Washington: Washington Center for Equitable Growth, 2018), available at https://equitablegrowth.org/grants/the-long-run-impact-of-temporary-disability-insurance-on-ssdi-claims-earnings-stability-and-labor-force-participation/. 108 Ruth Helman, Craig Copeland, and Jack VanDerhei, “The 2015 Retirement Confidence Survey: Having a Retirement Savings Plan a Key Factor in Americans’ Retirement Confidence” (Washington: Employee Benefit Research Institute, 2015), available at https://www.ebri.org/pdf/briefspdf/EBRI_IB_413_Apr15_RCS-2015.pdf. 109 Linda Houser and Thomas P. Vartanian, “Pay Matters: The Positive Economic Impacts of Paid Family Leave for Families, Businesses and the Public” (New Brunswick, NJ: Center for Women and Work, 2012). 110 David Autor and Mark Duggan, “The Growth in the Social Security Disability Rolls: A Fiscal Crisis Unfolding.” Working Paper (National Bureau of Economic Research, 2006), available at https://doi.org/10.3386/w12436; David H. Autor and Mark Duggan, “Supporting Work: A Proposal for Modernizing the U.S. Disability Insurance System” (Washington: Center for American Progress and The Hamilton Project, 2010). 111 Bruce D. Meyer and Wallace K. C. Mok, “Disability, Earnings, Income and Consumption.” Working Paper (National Bureau of Economic Research, 2013), available at https://doi.org/10.3386/w18869. 112 Nicole Maestas, Kathleen J. Mullen, and Alexander Strand, “Does Disability Insurance Receipt Discourage Work? Using Examiner Assignment to Estimate Causal Effects of SSDI Receipt,” American Economic Review 103 (5) (2013): 1797–1829. 113 Stephan Lindner and Austin Nichols, “The Impact of Temporary Assistance Programs on Disability Rolls and Re-Employment” (Chestnut Hill, MA: Boston College Center for Retirement Research, 2012), available at http://crr.bc.edu/working-papers/the-impact-of-temporary-assistance-programs-on-disability-rolls-and-re-employment/. 115 LeaAnne DeRigne and others, “Paid Sick Leave and Preventive Health Care Service Use among U.S. Working Adults,” Preventative Medicine 99 (2017): 58–62; Soumitra S. Bhuyan and others, “Paid Sick Leave Is Associated with Fewer ED Visits among US Private Sector Working Adults,” The American Journal of Emergency Medicine 34 (5) (2016): 784–89, available at https://doi.org/10.1016/j.ajem.2015.12.089. 117 Christopher J. Ruhm, “Deaths of Despair or Drug Problems?” Working Paper (National Bureau of Economic Research, 2018), availale at https://www.nber.org/papers/w24188. 119 Kanika Arora and Douglas A. Wolf, “Does Paid Family Leave Reduce Nursing Home Use? The California Experience,” Journal of Policy Analysis and Management 37 (1) (2018): 38–62, available at https://doi.org/10.1002/pam.22038. 120 Elisabeth Jacobs, “California’s Paid Family Leave Policy Is Decreasing Nursing Home Use and Saving Medicaid Dollars,” Value Added blog, July 9, 2018, available at https://equitablegrowth.org/californias-paid-family-leave-policy-is-decreasing-nursing-home-use-and-saving-medicaid-dollars/. 121 Eileen Appelbaum, Heather Boushey, and John Schmitt, “The Economic Importance of Women’s Rising Hours of Work” (Washington: Center for Economic and Policy Research and Center for American Progress, 2014). 122 The potential macro impacts of paid leave via the female labor supply channel are complicated by the diversity of the findings in the existing literature, as carefully weighed in Blau and Kahn, “Female Labor Supply.” For a more conclusive take on the evidence, see Claudia Goldin and Joshua Mitchell, “The New Life Cycle of Women’s Employment: Disappearing Humps, Sagging Middles, Expanding Tops,” Journal of Economic Perspectives 31 (1) (2017): 161–82, available at https://doi.org/10.1257/jep.31.1.161. 123 “Temporary Disability Insurance Workload in 2016: Summary Report,” available at https://www.nj.gov/labor/forms_pdfs/tdi/TDI%20Report%20for%202016.pdf (last accessed October 9, 2018); “Disability Insurance Program Statistics,” available at https://www.edd.ca.gov/about_edd/pdf/qsdi_DI_Program_Statistics.pdf (last accessed October 9, 2018); Office of Legislative Services of the New Jersey State Legislature, “Analysis of the New Jersey Budget: Department of Labor and Workforce Development FY2017-2018”; “Family Leave Insurance Workload in 2016: Summary Report,” available at https://www.nj.gov/labor/forms_pdfs/tdi/FLI%20Summary%20Report%20for%202016.pdf (last accessed October 9, 2018). 124 “Paid Family Leave (PFL) Program Statistics,” available at https://www.edd.ca.gov/disability/pdf/qspfl_PFL_Program_Statistics.pdf (last accessed October 9, 2018). 125 Susan C. Reinhard and others, “Valuing the Invaluable: 2015 Update” (Washington: AARP Public Policy Institute, 2015). 126 For more information on the Distributional National Accounts, or DINA, project at Equitable Growth, see Heather Boushey and Austin Clemons, “Disaggregating Growth” (Washington: Washington Center for Equitable Growth, 2018), available at https://equitablegrowth.org/research-paper/disaggregating-growth/. 127 AEI-Brookings Working Group on Paid Family Leave and Isabel Sawhill, “Paid Family and Medical Leave: An Issue Whose Time Has Come” (Washington: American Enterprise Institute and Brookings Institution, 2017), available at https://www.brookings.edu/wp-content/uploads/2017/06/es_20170606_paidfamilyleave.pdf. 128 Ibid. ; AEI-Brookings Working Group on Paid Family Leave, “The AEI-Brookings Working Group Report on Paid Family and Medical Leave: Charting a Path Forward” (Washington: American Enterprise Institute and the Brookings Institution, 2018), available at https://www.aei.org/wp-content/uploads/2018/09/The-AEI-Brookings-Working-Group-Report-on-Paid-Family-and-Medical-Leave.pdf.